The Apple Watch has garnered a mixed response from fitness enthusiasts. This is due in part to it lacking essential features, like GPS. That hasn't stopped many people from snapping one up, though Apple still won't say how many exactly. While you wait for watchOS 2 to fix some of the underlying issues that are holding the Apple Watch back, check out these tips and tricks for getting the most from it while completing your daily workout. Sure, you can take your Apple Watch out of its box and hop on the treadmill, but to get the most effective results, you need to train it to understand you. 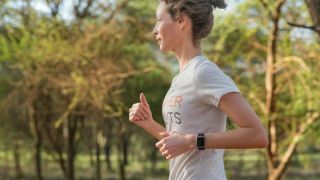 To analyze your stride correctly, go for a 20 minute run or walk outdoors with your iPhone as well as your Apple Watch. The Watch will calibrate your pace against the GPS on your phone, gradually learning how fit you are and what your stride is like. It uses that information to accurately understand how many calories you burn, both while running and while participating in other workouts. Regularly conducting this kind of calibration at different speeds makes it even more accurate. In time, you'll have near GPS-quality figures, even if you don't have your phone with you or if you're running indoors. While the Activity app is all too keen to monitor everything about your day and not just how many steps you've taken, it's not immediately clear how things work. The blue "Stand" ring is the most confusing of the three. Rather than informing you when you haven't stood up for an hour, it'll notify you when you haven't moved around for that hour in a twist that's sure to confuse those with standing desk arrangements. When it does buzz at you to stand, move around for at least 60 seconds to keep your body, as well as your Apple Watch, happy. Do this across 12 different hours in the day to reach your daily Stand goal. The Green ring represents any exercise equivalent to a brisk walk or more. It tracks what you usually do throughout the day so it won't pick up casual walks around the office - but it will detect if you're rushing across that same office. Looking at your general stride as calibrated earlier, the accelerometer (and GPS / WiFi on your phone if connected), it figures things out according to your general exercise levels. Rarely do much exercise? You'll see this ring increase just for going for a long walk. Avid runners will have to push things a bit harder for the Apple Watch to appreciate their efforts. The red "Move" ring ties into the other two rings. It tracks the calories you're burning through moving around, rather than the resting calories that other activity trackers provide. If you force press the screen, you can change your daily Move goal, either taking it easy for the day or pushing yourself a bit harder. A swipe up on the ring shows you a detailed breakdown of your progress that day. The Apple Watch has been fairly criticized for its mediocre battery life, but there's an effective method for improving battery life while you exercise. Using the Apple Watch app on your iPhone, you can turn off the heart rate sensor, saving your Apple Watch from constantly calculating this while out on long walks or runs. You'll still be able to track speed, distance, elapsed time and the amount of active calories you've burned. You just miss out on tracking your heart rate. If you're really low on power and willing to forego those features while you finish up, you can always switch to Power Reserve mode, turning your Apple Watch into an ordinary watch. Hold the power button down for a couple of seconds and drag the slider to Power Reserve. This won't track your workout though, so only use it in emergencies. Sometimes, you want to go out for a run without your iPhone but you don't want to miss out on listening to music. It's a little cumbersome and you're limited to 1GB of music at most, but the option is there. First, create a playlist on your iPhone before switching to the Apple Watch app. Go to the Music app option and choose your playlist to start the syncing process. If it doesn't start immediately, put your Apple Watch on its charger. This should fix any syncing issues. You can't listen to any music until you pair your Apple Watch with Bluetooth headphones, so don't forget to do that. After pairing, tap on the music app, then select Source > Apple Watch and start listening. The Apple Watch does an OK job of offering some useful basics to get you started, but there are great third party alternatives to try too. For running or cycling, Strava and Runkeeper do a great job of allowing you to track your progress through your wrist in a more detailed manner than the Workout app. Both offer community-led features that include encouragement through friends as motivation to keep you moving. Runkeeper goes one step further by providing exercise plans for those new to running or keen on working towards completing a marathon. It's not just cardio that benefits from third-party support. The Pocket Yoga app waves that flag for learning different Yoga poses by simply requiring you to look at your wrist rather than your phone screen. Apps such as Lifesum focus on eating and drinking well, using your Apple Watch to remind you to drink more water as well as offering a way for you to track what you're eating.